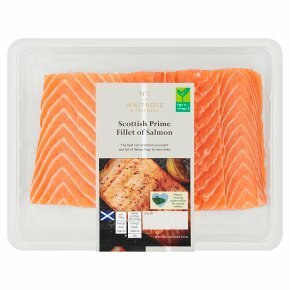 The best cut of salmon, succulent and flaky, farmed around the Scottish coast. Ready to oven bake for 25 minutes. INGREDIENTS: salmon (Salmo salar) (fish). Pan Fry. Time: 18-20 mins. Remove all packaging. Heat a dessert spoon of vegetable oil in a frying pan over a medium heat. Pan fry fillet for 18-20 minutes, turning occasionally during cooking.